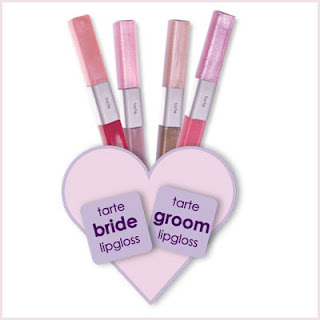 Tarte Cosmetics will personalize their lip glosses for your wedding. Just a few of history’s famous couples! At tarte we’ve celebrated these “perfect pairs” with our double-ended lipgloss! Now we’d like to honor YOU… the couple-to-be! 1. Choose a lipgloss duo from one of our existing pairs. 2. Order 25 or more at least one month in advance. 3. Provide us the name of the happy couple. Min order is 25 and a little pricy but how great would that be to give to all the ladies at your wedding -or stick in the out of town bags.